Preview the new look of SCORE Science. New design by College of the Redwoods Multimedia Program. SCORE Science is maintained by the Humboldt County Office of Education. 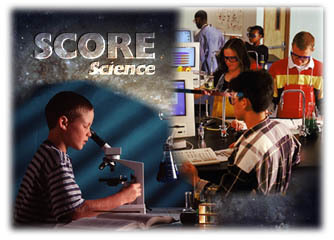 Funding for SCORE was provided, in part, by the California Department of Education from 1996 - 2000. For standards-based reviews of commercially-produced software, video, and Web resources, visit the new California Learning Resources Network (CLRN) Web site.